The Main Battle Tanks of Asia: Junk or Still Useful? The main battle tank will remain part of Asian-Pacific military arsenals for some time to come. While this assertion may hold true for militaries worldwide in the long-run, for now it appears to apply uniquely to the United States, which like no other nation on earth has a history of expeditionary warfare and enjoys a high degree of security from invasion by a conventional foe. Consequently, with the U.S. tank force numbering around 6000 main battle tanks (MBTs), it makes sense for the United States military to allocate resources to other weapons programs. However, looking to the Asia-Pacific the story is different. There, the majority of countries are in the process of upgrading their tank forces. In a recent article, the Asian Military Review has listed the major procurement and upgrade programs in the region. Almost every regional power is investing in new tank forces. For example, China currently fields approximately 8000 MBTs, 5000 of which are of the obsolete Type 59 – a Chinese produced version of the Soviet T-54, 55 series. However, the People’s Liberation Army has acquired around 700 of the advanced Type-99 MBTs. China is also working on a cost-efficient modern MBT, the MBT-3000, specifically designed for export to developing countries. By 2020, India plans to procure 1657 Russian T-90 tanks (1000 of which will be build domestically under a technology agreement with Russia), enough for 59 tank regiments. 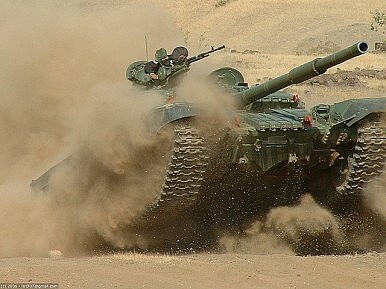 In addition, India will upgrade its 1900 strong T-72 MBT force, and will continue to build indigenous third generation MBTs (the Arjun MKI and MKII). Japan is currently downsizing its tank fleet of Mitsubishi Type 90 MBTs to 400, but it will add 68 new Mitsubishi Type 10 MBTs – a lighter and more agile tank better suitable for urban combat, the type of warfare that the Japan Self-Defense Forces are most likely to face in the defense of Japan. The backbone of the South Korean tank forces are the Hyundai KI and KIAI MBTs. General Dynamics has assisted South Korea in upgrading this fleet of 1500. The military also aims to acquire 397 new K2 Black Panther MBTs, currently being developed by Hyundai. Other Asia-Pacific countries have also gone on a tank buying spree: Indonesia is projected to receive the last of 104 German Leopard 2A6 MBTs by 2016, Bangladesh has ordered 44 Chinese MBT-2000s, Thailand is expected to purchase up to 200 MBTs in the years ahead, and Pakistan aims to increases its MBT force from 300 to 600 in the near future. Finally, Taiwan aims to replace its aging tank fleet and might purchase the M1A1 Abrams from the United States. Malaysia, Singapore and Vietnam, while currently not planning to expand their MBT fleets, are nevertheless gradually upgrading existing forces. It is fair to conclude, then, that the MBT will be part of Asian-Pacific military arsenals for a while. Why Asia's militaries will hang on tanks, even as the United States moves on.